Are you observant? Do you have a keen eye for details? Do you have a pretty good vocabulary and might know a couple different names for things that might start with a different letter? Then you'll probably be pretty good at Kaleidos, a new game available from CMON. In Kaleidos, players agree to use one of the many different, beautiful, rather busy and filled pictures. Then, they see what letter that all objects must start with. Then, at the same time, everyone starts looking at their picture. The object is to find items in the photos whose name starts with the letter selected. You earn points for objects you find, plus bonus points for finding items that nobody else did. Once the clock runs out, everyone compares their answers. The one with the most points is the winner for the round. Grab your next photo and letter and get going for another round! 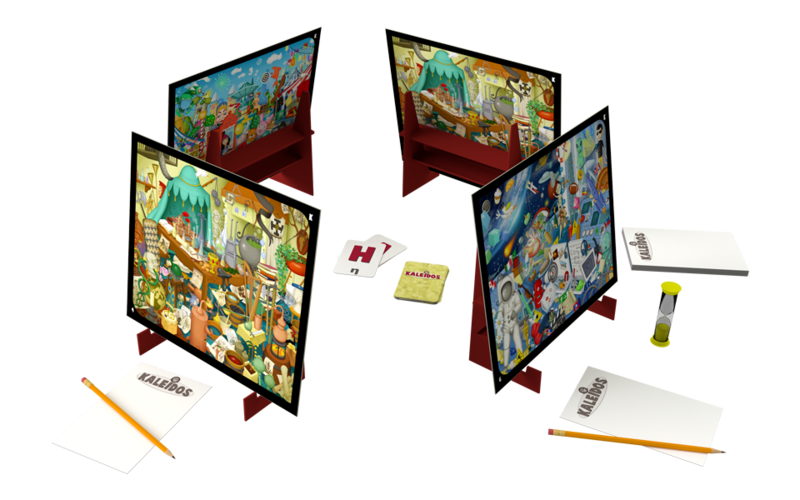 Kaleidos is easy to learn, quick to play, and family friendly, so everyone can get in on the gaming. It's also available now.